To the people who feel strongly that the name shouldn't change, what would be your reaction and reasons for or against a team called the Mujahideen? rhy7s: To the people who feel strongly that the name shouldn't change, what would be your reaction and reasons for or against a team called the Mujahideen? I think you should take what has happened a little more seriously and not go disrespectfully dropping suggestions like that. Some good reading here about the Crusades....not something I know a lot about but the history is complex and I dont believe the Canterbury Rugby Union chose a name because it evoked a holy war against Muslims. "On campaign, the crusaders’ main opponents were the Seljuk Turks. The Turks were originally a largely shamanistic and nomadic people who had migrated from the Central Asian Steppe region to conquer much of the Muslim world during the century preceding the crusade. They had seized Syria and the Holy Land only 20 years previously. By the 1090s, the Turks had begun to convert to Islam but many retained elements of their former beliefs. During the crusade – and in later decades – observers noted that some Turks still (among other things): buried their dead with grave goods, scalped enemies, and conducted colossal drinking parties. All these customs reflected their former traditions and many of these and other practices conflicted with Islamic teaching. So the Turks – the crusaders’ main opponents – were hardly longstanding adherents of Islam but instead were part of the way through a long-term process of religious transition." I find it very questionable we have a team of predominately dark skinned males called "The All Blacks"
I find it very questionable we have a team of predominately light skinned males called "The All Whites"
Those are just some colours, like red and blue and etc. The team in question is a movement, and there is no ambiguity about it. Imagine playing a team called the Jihadis. There is no movement called the crusaders or what ever, where did you get that idea from?? 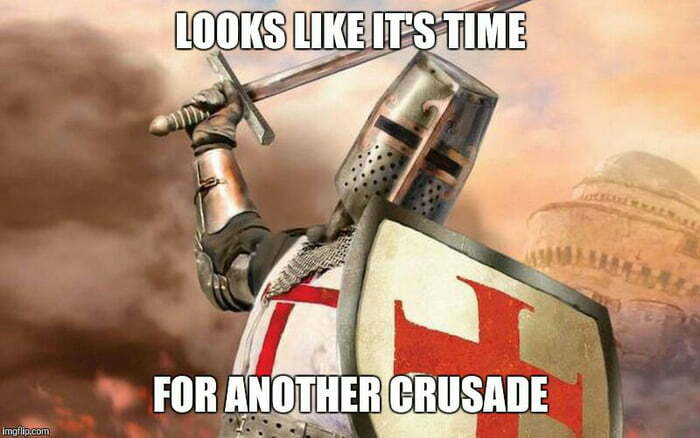 https://knowyourmeme.com/memes/deus-vult This is a meme thing about going on a crusade which effectively means making noise cause you don't like something. Handsomedan: But surely nobody could be offended by The Blues...I mean, it's not even like they're in it for the points. Name change for the Crusaders seems inevitable, kind of feels like they've painted themselves into a corner. You can't say you're considering it in light of what's happened, then come back and say we've thought about it and nah. In my opinion a name change cannot happen fast enough. Mark Richardson has come out in support of a name change. The CEO for the Crusaders has said a name change had already been discussed prior to the tragic events on Friday. Today I went to look at the floral tributes left at the Botanic Gardens and to read the messages, many of which had been written by children, and it only highlighted how utterly insensitive and stupid it would be to to continue the use of the 'Crusaders' name. Even before this tragedy the completely inappropriate pre-match display of knights, broad swords, and horses made me cringe as it would anyone who had spent even an hour's study of what the Crusades really were. Let's hope a change is made, & quickly. If the franchise does not change its name it will be an utter disgrace. 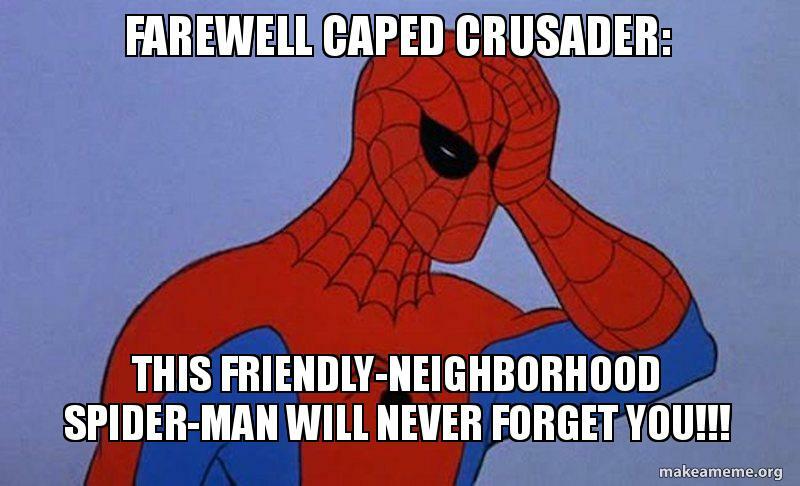 To those saying that crusade(s)/crusader(s) can refer to anything, well this picture sums it up pretty clearly that it does not. The reality with most of the crybabies decrying political correctness and projecting some kind of nonsense upon those who believe that decency requires a history, context, and community-aware team and individuals involve with it to seriously consider changing its name is this: they love to cry about some "other" being easily offended, being pathetic, ridiculous, or unduly demanding etc. But it's actually them who are easily scared, offended, and pathetic. Your point is absolutely right: if this team is as special as its supporters think it is and as it purports to be (I don't particularly care one way or another -- couldn't give two hoots about rugby), a mere change of name won't affect it or any truly loyal fans one iota. It wasn't a front of mind issue this time last week and there wasn't any public clamouring for a name change then. I'm not aware there was any undertone of anyone being offended by the name prior to last Friday. We have one crazy zealot who goes on a killing rampage and now there's a call for a change to the name of a team that had nothing to do with what happened. The Crusaders name didn't spark the attack and changing the name won't stop any other similar attacks. I'm sorry I don't see the logic in changing the name. Nobody is saying that the Crusaders caused the attack or changing the name will stop similar attacks. Stop playing with strawmen. What people are saying is that the team's emblems and imageries reference historical events that are utterly offensive and hurtful to a vulnerable part of our community, is inappropriate in view of recent events, and is furthermore completely tone deaf as to such imagery and emblem's historical origins. Get it? Extending people the courtesy of considering their arguments fairly or, at a minimum, representing what they are saying fairly, will make you a slightly more decent human being. Give this a try sometime.